Saba thoughtfully, with her sweet pink shirt. Nikon D5 and Art Sigma 85mm F1.4 at F1.4, the daylight of a late afternoon. After several wide-angle and super wide angle we are grateful to Sigma to be back at longer focal lengths. Hopefully not the last, seeing the features and performance of this 85mm We can only imagine how it will be possible with a 135mm bright or the already patented 200mm F2. Returning to this new creation, is clearly seen in the primer look how Sigma, to propose a lens of different characteristics from the many 85mm on the market, has substantially free the designers. It came out a giant scrambling all well-established games, at a price that is very competitive with all 85mm of the other brands. - Distortion? What is distortion? 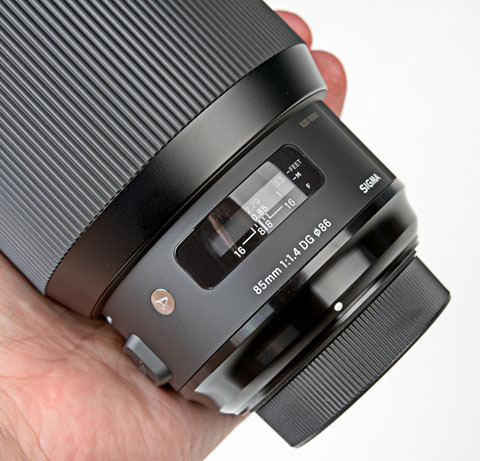 It's - in my opinion - without a shadow of a doubt the best lens of the Sigma Art series presented so far. If this is a preview of what will be proposed in the coming years, my old friends, is better to start putting money aside. I think the various Nikon and Canon 85s become - despite the higher price - for second best. The only trick up in their sleeve is paradoxically due to the size and much lower weight. ... But in terms of absolute performance the only lens that can be compared with this Sigma is a manual focus lens that needs to be placed in drums with a sturdy tripod's and focused in live-view (if the subject makes that possible. ...). If you can test it, ensure that it is calibrated in focus. Mine had an obvious front-focus. While the Canon that we tried in the studio on December 4 had back-focus. Things settle down in a few minutes, using the USB interface of Sigma and the management program for available for free download from the Sigma website. Dear Mtrading friends, I'm plotting every excuse not to return it for a while, so I can continue to play with! well-deserved rest. F1.4 to blur every detail and make the matching image at the time. Thank you once again Mtrading, importer and Sigma official distributor in Italy for allowing us the review sample for this test.